Stephan's Quintet: A compact group of galaxies about 280 million light years from Earth. 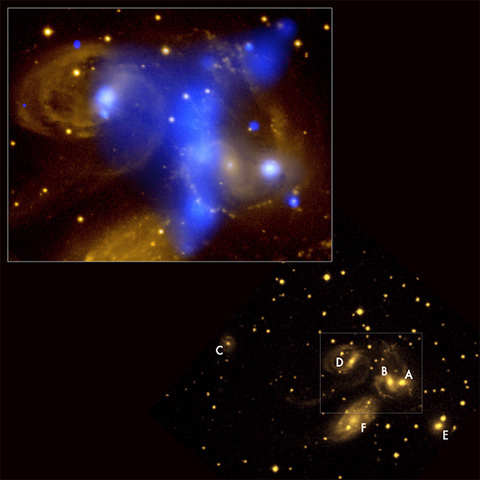 Caption: In the upper left a Chandra X-ray Observatory image (blue) is superimposed on a Digitized Sky Survey optical image (yellow). The X-ray image shows hot gas heated by a shock wave created by the rapid motion of the central spiral galaxy (galaxy labeled B in the wide field optical image on the lower right). The group consists of the galaxies A, B, C, D and E shown in the wide field optical image. The large-appearing galaxy F in the lower left of this image is a foreground galaxy, and is not part of the group. Collisions of the galaxies with each other and with the hot gas are stripping cool gas from the galaxies and depriving them of the raw material from which to form new stars. Over billions of years this activity will likely transform the spiral galaxies in Stephan's Quintet into elliptical galaxies.